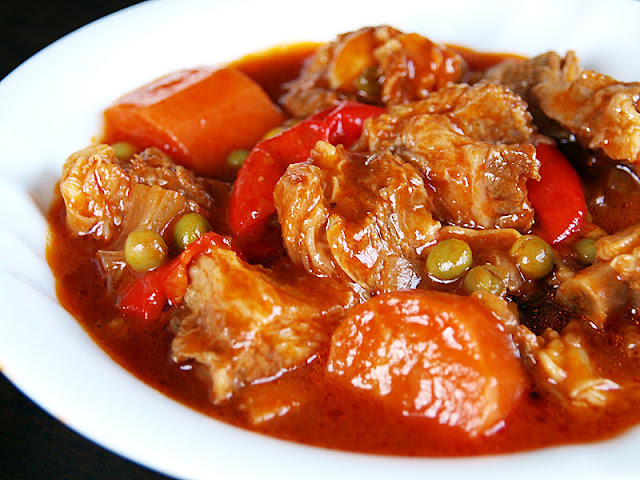 Caldereta, another Filipino dish tracing its roots to Spain, is a rich stew made of beef stir-fried in olive oil and simmered to perfection in a tomato sauce. Originally, goat meat was used for this dish, but nowadays, beef, pork or chicken are used. 1 Heat the oil in a saucepan and stir-fry the garlic until golden brown, then stir-fry the onions until translucent. Add the tomatoes and bell pepper, and cook until they soften. Add the beef and liver, and stir-fry for a few minutes. When the liver is cooked, remove it from the saucepan and set aside in a small bowl. 2 Add the beef stock and tomato paste, and simmer over low heat until the beef is tender, about 45 minutes. Season with the pepper. 3 Add the olives, dill pickles and chilies. Mash the liver with a fork and return to the saucepan. 4 Cook until the sauce thickens, about 5 to 7 minutes, then add the cream and cheese, and mix well. Remove from the heat, transfer to a platter and garnish with the bell pepper or pimento strips.